3.3.015: Former Panchajanya editor Baldev Sharma is appointed as the chairman of National Book Trust. He was appointed by Union Ministry of Human Resource Development. Panchajanya is a newspaper published by Rashtriya swamyamsevak Sangh every week. The newspaper was initiated in 1948 in Lucknow. 3.3.2015: King Faisal International award that is given to people who serve Islam every year is given to Fr. Zakir Naik for 2015. Zakir is the second Indian to win this award. This award was presented to Zakir in a ceremony in Saudi and was presented by King Salman. Two lakh dollar cash prize and 200 gram gold medal certificate are given to him. Zakir said that he is very happy to receive the award. Zakir is the president of Islamic Research Foundation in India. After receiving the award, he said that he will donate his cash prize to Peace TV. 3.3.2015: KS Lavkumar Khachar, pioneer of nature conservation in India passed away at the age of 84. He was associated for a long time with Bombay Natural History society and World Wide Fund for Nature India. He also served as director of Nature Discovery Centre in 1984. He was honored with many prestigious awards including Salim Ali Loke Wan Tho Lifetime Award for Excellence in Ornithology. He also won Venu Menon Lifetime Achievement Award in 2004. 3.3.2015: Rasna appointed Bollywood hero Akshay Kumar as its brand ambassador for this year. An ad film is made with Akshay Kumar, daughter of Rasna CMD Piruj Kambatta and Rasna girl Avan Kambatta. Rasna Fruit plus 500 gram pack will be launched this summer and as a launching offer 500 ml sports bottle will be offered free. With one liter packet a super sipper will be offered and with fruit fun packs an attractive jug is offered as free gift. Rasna will also sell Rs. 1 and Rs. 5 sachets for rural markets. 3.3.2015: Mary Kom, Indian woman boxer announced that she will quit boxing after Rio Olympic Games that are scheduled in 2016. She is 32 years old. She won bronze medal in London Olympics in 2012. 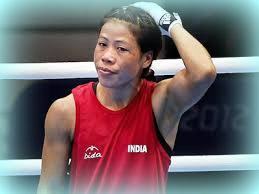 She revealed that after retirement she will concentrate on Boxing Academy set up by her in Imphal, Manipur. This entry was posted in Current Affairs, News on March 4, 2015 by Rakesh.